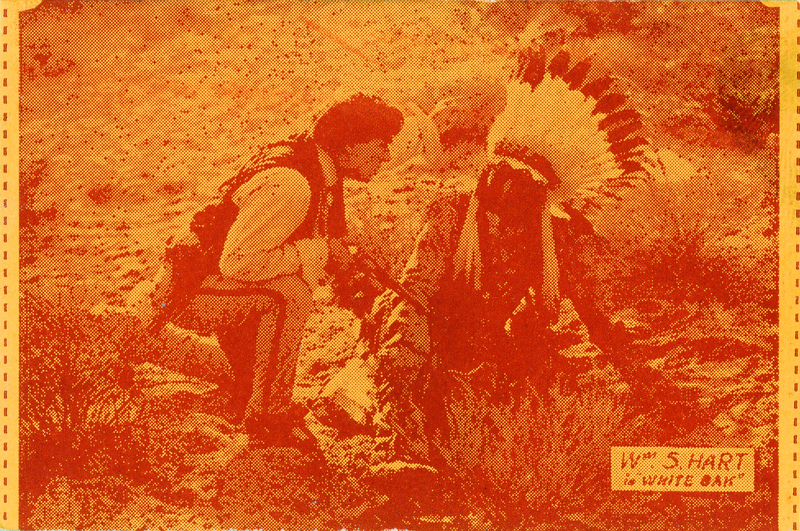 SCVHistory.com LW3358 | Tobacco Card: William S. Hart & Chief Luther Standing Bear in 'White Oak' (1921). William S. Hart (as Oak Miller) and Chief Luther Standing Bear (as Chief Long Knife) in "White Oak," produced by Hart in 1921 and distributed by Paramount Pictures, then a subsidiary of Adolph Zukor and Jesse Lasky's Famous Players-Lasky Corp.
About Chief Luther Standing Bear. MORE: Read Hart's introduction to Chief Luther Standing Bear's autobiography here. Produced by the William S. Hart Company; distributed by Paramount-Artcraft; released December 18, 1921; ©August 15, 1921; seven reels (6208 feet). Directed by Lambert Hillyer; screenplay by Bennet Musson from the story "Single Handed" by William S. Hart; photographed by Joe August; art director, J. C. Hoffner; edited by William O'Shea; art titles by Harry Barndollar. CAST: William S. Hart (Oak Miller); Vola Vale (Barbara); Alexander Gaden (Mark Granger); Robert Walker (Harry); Bertholde Sprotte (Eliphalet Moss); Helen Holly (Rose Miller); Standing Bear (Chief Long Knife). LW3358: 9600 dpi jpeg from original card purchased 2018 by Leon Worden. Note: This example is encapsulated.